Version 1: Failed. When tested with mild winds it showed signs of fatigue. Under heavey winds it bent beyond repair. I must note however that the primary reason for failure was mis-rigging the pole. I did not attach the uphaul and down haul to the ends of the pole which led to the pole having to actually carry the load. In Version 2 of this project I replaced the aluminum tube with a thick walled version that I purchased from www.onlinemetals.com . How many folks do you know that would make their own jib pole. Well after the adventure with my first jib pole, see Davy Jones Locker, I was determined that I could make one myself. This is one of those cases where you loose your mind and think you're going to do something great and all it really gets you is a lot of strange looks when people see what you've done. So what I did was go in search of a rugged painters pole. It took a lot of searching but I found one made of bright yellow fiberglass and aluminum. The bright yellow fiberglass made up the outter tube with the aluminum tube inside. It had a twist lock action with a nice large grip ring near the junction. I also had to remove about 18 inches of the bright yellow fiberglass to make the pole fit between the mast and the foreward shroud. Now as luck would the replacememnt clips fit the aluminum tube. So I cut off about a eight inch piece and epoxied and screwed one clip onto it. Then I epoxied this short end into the bright yellow fiberglass tube. Now the other side of the painters pole had the slide out aluminum tube (minus the 8 inches I cut off) to which I epoxied the other clip. So does it work? Well, I tried it once with my spinnaker and it didn't break!!! How's that for an answer. Total Cost: $60 about half the cost of my first pole. 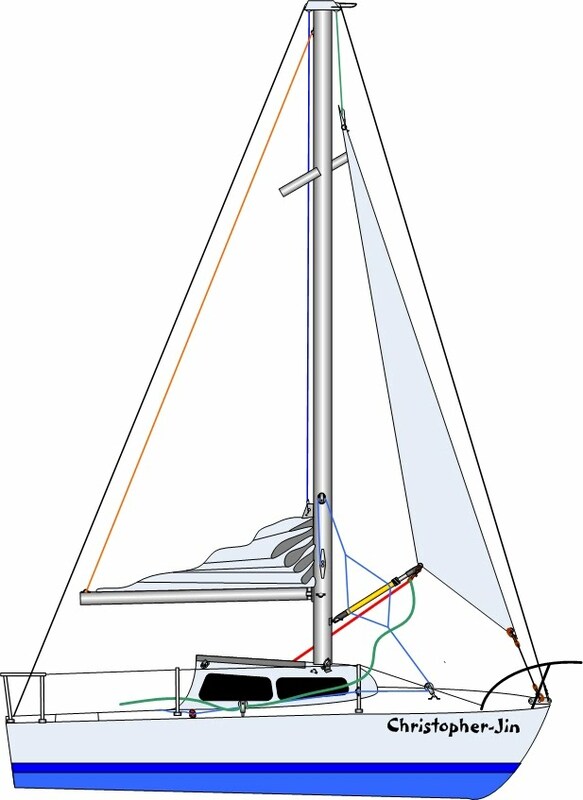 As you can see the Jib Pole or Whisker Pole can have several control lines. The Up-Haul is attached to the mast and the Down-Haul is attached to the deck and run back to the cockpit. The Up-Haul hold the Whisker Pole up at the proper level for easy attachment. The Down-Haul helps keep downward pressure on the clue end of the Jib. The illustration shows the Christopher-Jin on a Run with the Jib on the Port Side. Being on a Run in lite air, the Jib will tend to collapse often. The Whisker Pole keeps the Jib out so when the wind picks up again the Jib is ready to catch some more air. The addition of a Lanyard at the Mast end and long Lanyard at the Sail end make for quick removal of the Whisker Pole.